The rootstock on which a tree is grown determines it's size, vigour and to some extent it's disease resistance. A tree grown on an M25 rootstock would be well suited to an orchard or very large backgarden and will produce a large yield of fruit on maturity. Trees grown on a more dwarfing rootstock such as the M9 will be smaller and better suited to a small back garden and will fruit sooner but will not live as long as trees grown on the more vigorous rootstocks. Vigorous 25ft - 30ft 5 - 6 years No staking if planting as a 1 year old tree. 3 years if planting an older tree. Semi-Vigorous 10ft - 13ft 3 - 4 years No staking if planted as a 1 year old tree. M25 is a full standard (a traditional orchard tree) and the largest and most vigorous rootstock. Trees grown on an M25 rootstock will grow to about 20ft - 30ft in height. You should expect your first decent crop of fruit from a 5 - 6 year old tree. M25 trees should be spaced 30ft apart to allow room for their very vigorous growth and should be productive for 50 years. Trees grown on the M25 rootstock are commonly used in traditional cider orchards and eventually yield 100kg+ of fruit per tree. MM106 is a semi vigorous rootstock. Trees grown on MM106 rootstocks will grow to about 10ft - 13ft in height and will require spacing of around 12ft - 15ft feet. You should should expect your first decent crop of apples from a 3 - 4 year old tree. This rootstock is one of the most commonly grown in Wales and is suitable for most sites. M9 is a dwarfed rootstock and produces a tree that will reach 6ft - 8ft in height and requires spacing of 6ft. The first crop of fruit should come from a 2 - 3 year old tree. The M9 is suitable for small back gardens and will require staking and grass/weed control, it does well against a south facing wall or fence. Most supermarket fruit will have come from trees grown on M9 rootstocks. The following chart gives some idea of the number of trees grown on each rootstock that can normally be grown per acre, this can be helpful in working out how many trees you would need to plant a given area or how big an area you would need for a given number of trees. 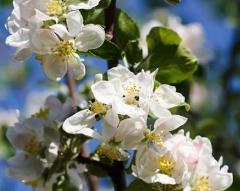 For all apple tree varieties, pollination of its blossom needs to take place in order for it to grow any apples, for this most trees will need a pollination partner (another apple tree). Some varieties are either fully self fertile and are able to pollinate their own blossom or partially self fertile in which case they are able to produce a reduced crop without a pollination partner. Each variety is allocated a pollination group or number which relates to when the tree is in blossom. To achieve pollination a tree will require a pollination partner from the same group or the group either side of its own pollination group. PSF Partially Self Fertile - can pollinate some of it's own blossom but ideally needs a pollination partner for maximum cropping. If you need any advice with pollination groups please do not hesitate to contact us for further information and advice.